The Rattlers dug deep and still had the, “lets have some fun” attitude and a whole lot of heart. The Rattlers defense was solid with Mike Strader leading the Infield at shortstop and Jim Rini at second base. 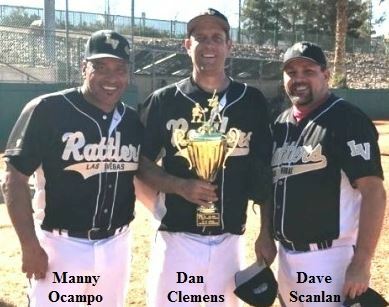 Outfielders Dave Scaringe, Tri La, Javier Arias and Tommy Montoya endured outfield coverage throughout the weekend. An aggressive and smart offense gave us enough to succeed, knowing we had strong pitching and a great defense. Drew Zoulko and Marco Gutierrez were rocks and cannons behind the plate and other contributing/starting pitchers that made a difference were Earl German and Eric Ogletree. It should be noted that Sam Pacheco and Alfonso “Junior” Gandara handled the hot corner at third base with a lot of love shared between the two! Props go to Mike Stader for handling the “Made to Order” laundry service for all players between game days! !